Since the dawn of history, man has been hunting for hidden treasure. Some searches legit, and others just tall tales. The treasure is buried on land or in sea and the only way to find it is to use a map. Maps can be sonar, scraps of paper with drawings containing parts of clues, even etchings on cave walls. Maps can come in the form of riddles, codes, legends or simply word of mouth. Anyway you look at it, when searching for hidden treasure, you’re going to need a map to guide you. Forrest Fenn of Santa Fe, New Mexico buried a treasure somewhere in the Rocky Mountains worth an estimated $5 million dollars. He thought it would make great fun for families to explore and get to know the other treasures of the wilderness he has loved his whole life. His map; a riddle. Over 30,000 people from all over the world have followed his map, but after 5 years the treasure still lays buried. The multi-millionaire would love someone to find the ornate box filled with gold, precious gems and valuable artifacts that he buried somewhere in New Mexico, Colorado, Wyoming or Montana. The good natured Fenn has made his map into a book called The Thrill of the Chase. Will you be out there any time soon? Many ships crossing the great oceans have sunk carrying their crews and rich bounty to the bottom of the seas. The oceans are vast and with the shifting tides and erratic weather, these sunken treasures have been nearly impossible to find. With more modern day mapping technology and acquired skills the ability to narrow down and chart a search area has become much more plausible. One of the best known treasure hunters of our time is Mel Fisher. Fisher, who I met in 1982, knew that with the right instincts and sonar mapping, he stood a very good chance of discovering the long sunken treasure of the Spanish galleon Nuestra Senora de Atocha. After 16 years of searching, his nautical mapping/charting brought his crew into a smaller vicinity off the coast of Key West. Clues were given along the way until a more precise map was formulated and then on July 20th, 1985 his son, Kane, and his crew found the Mother Lode of the Atocha valued at $450 million! Legitimate treasure maps are rare. Those that are found are usually discovered by accident in a pile of antiques, or someone’s attic. Some are handed down through family generations, and although rare, they do exist. The well known outlaws Jessie and Frank James supposedly buried treasure throughout the west. They left many of their maps with the secret order The Knights of The Golden Circle which they were members. The Wolf Map was discovered stashed in a tea kettle buried in the Wichita Mountains of Southwest Oklahoma in the 1930s. Enticing and showing promise many of the landmarks from the map were found, but, so far not the actual treasure itself. The nature of old maps is that they were made when the landscape represented the day. Following a dated map requires layering revised maps onto the original. There is still plenty of cache to cash in on, so how are your mapping skills? 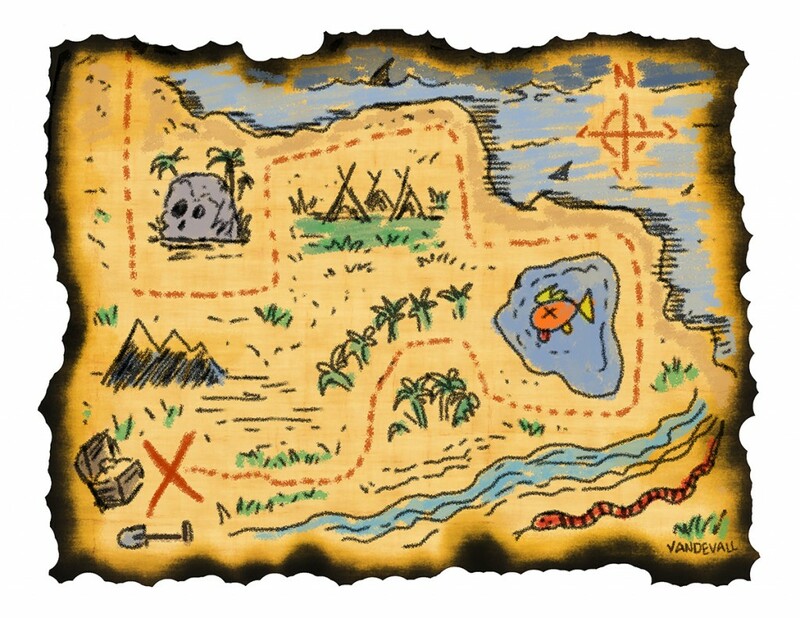 What is your favorite treasure map story? Leave a comment below.